Situated on one of the world’s finest stretches of beaches, the 3-bedroom Pelican’s Landing condos are modern, well maintained and come with everything needed for the perfect, carefree vacation home or even a residence. 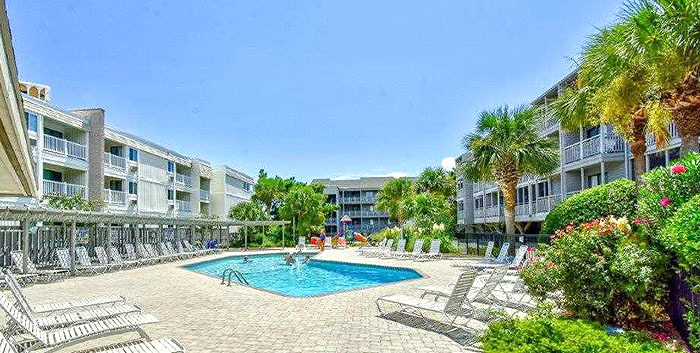 Features of these Myrtle Beach condos include an outdoor pool, private balconies and screened in porches, upgraded interiors, and mostly location, location, location. You can walk to the Grand Strand's only beachfront public pool and nightclub, Ocean Annie's. The Apache Pier is an easy stroll away with live entertainment there throughout the summer. Just across the street are restaurants, a grocery store, and other shops and services. The elegant Arcadian Golf Course beckons with moss-draped trees and some of the most beautiful greens in the Grand Strand. And you'll be just minutes from the Tanger Outlet stores, a super Walmart, and a small strip shopping center with stores like Target, Lane Bryant, and others. Just north of that is the Myrtle Beach Mall with Belk, JC Penneys, Carmike Cinema, and many more restaurants. These condos are perfect for the discerning owner who likes security, privacy, and being away from the traffic in the main beach areas.